They paddled John at St. Michael’s school in Santa Fe because he couldn’t read. Every child got their turn striking the back of his legs before John was sent ignominiously back to the seat that he occupied in the “Dumb Row.” Back there, he could continue to stare at the meaningless squiggles that seemed to make sense to every other kid in his class—but not, alas, to him. No one wanted to read more than John did. Like most children who struggle with learning disabilities, he was ashamed of his failure and did absolutely everything possible in his power to disguise his problem. He was extremely adept at behaving in a way to avoid drawing any attention to himself that might reveal his disability, and so good at hiding his abject failure and the cheats he created to compensate for it that even his parents and closest friends did not realize how utterly and totally he struggled as a reader. Truth be told, John couldn’t read a billboard, street signs, headlines—in fact, John couldn’t read anything. Miraculously, John survived in school because of an exceptional ability to remember what he heard, and by aggressively using friends and other students as helpmates in “discussing” his reading assignments, in “helping him” write or type required written reports, by using every trick under the sun to escape written exams, and by becoming a master at cribbing off of other kids in class. It helped that John was intelligent, a superb athlete, personable, positive, and easy to forgive. Still, John was like a duck on the water—calm on the surface, but out of view, paddling furiously. John lived in continual fear that his friends or teachers or family would discover the profound level of his impairment—which he believed would mark the day that his happy life would come to an end. How far can you advance in an American school system when you can’t read at all? John was helped in advancement because he was an athlete, and that undoubtedly eased his progression through junior high and high school, his graduation from a junior college, then perhaps astonishingly, his graduation from the University of Texas at El Paso. With absolutely no ability to read, what could a smart young college graduate like John possibly adopt as his life’s profession? John became a high school teacher. He got the job, in part, because he had his father fill out his application, which he verbally dictated to his dad over the phone. When John met with his new boss several weeks later, he discovered that one of his first assignments would be to teach English grammar! Just at a time in life when he may have walked remarkably unscathed out of the minefield, John voluntarily re-entered it, back where the risk of discovery—perhaps the greatest threat to his mental and emotional life and limb—was even greater! Most facile readers do not know how heavy the burden of shame can be for the non-reader. I once had a conversation with a gentleman who then ranked among the 100 wealthiest Americans, when the subject of reading failure in school-aged children came up in conversation. A tear glistened in his eye when he was reminded of his own childhood dyslexia. Children who struggle with reading may think, “Why can’t I do something that most other kids can do? What’s wrong with me?” These questions are difficult for any child to escape, and many find themselves repeating them a thousand or ten thousand times. Those questions, and the shame behind them, reside in the recesses of the mind of most non-readers for the rest of their lives. John has beautifully described the personal burdens he carried into his classrooms as being “the schoolteacher who could not read.” He operated in continual fear that his students and professional colleagues would discover his learning deficit. No time was spent at the blackboard in John’s classes! He became an expert at having his students read their assignments and educational materials to one another—in effect, teaching themselves in his classrooms. He spent lots of time listening to teaching materials on tape, and in talking with his fellow teachers about their lesson plans. Perhaps the fact that no essay assignments were made in his classes added to his popularity as a teacher! John spent more than a decade as a tenured teacher at different public high schools in Southern California. He was well-regarded by his superiors as an engaging and effective teacher and coach. His wife was the only person in his world who knew that he could not read a word. It was only after a successful departure from education into a business career, during a period when his business was in the doldrums, that John finally decided, once and for all, to try to kill the demon that he had so long been carrying around with him. Near his 48th birthday, he entered an adult reading recovery program in San Diego. Starting back at the beginning, as if he were a baby again, under expert professional tutelage, John gradually re-acquired all of the language and visual skills that support reading, then slowly mastered reading itself. Not too many months into that program, John could read. He could read the newspaper. He could read the telephone book. He could read magazines and novels. He could read everything. John now reads voraciously. He reads for fun. He loves to write. John has been transformed, through adult brain plasticity. John is no longer ashamed. You would be a rare individual if there were not things in your life that have held you back—sometimes, more than a little. John’s experiences show us, once again, that transformation in your neurological abilities is not just the stuff of childhood. Even the most fundamental of problems can potentially be addressed at any age. Like John, you (and all those people that you care about) can improve at almost any ability, with appropriate forms of brain training. After all, your brain is just as plastic as John’s brain! 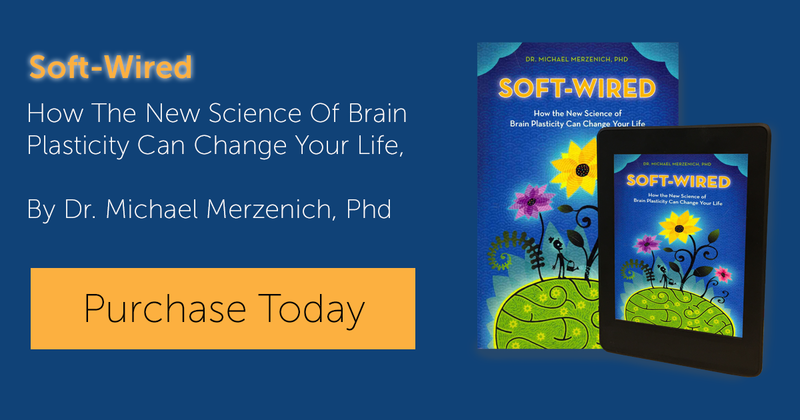 To continue reading Soft-Wired, you can buy it on Amazon in paperback or Kindle format.